Like Earth didn't have enough messes for them, janitors extraordinaire Doug and Manny are off to outer space! Mendy, the girl of Manny's dreams, has been whisked away by an alien bounty hunter and it's up to the boys to do whatever is necessary to get her back! Luckily, they won'... read full description below. 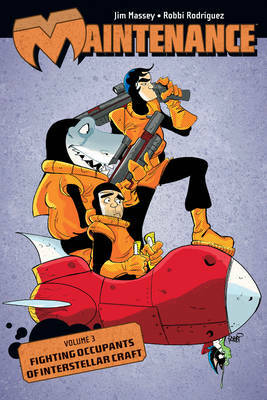 Like Earth didn't have enough messes for them, janitors extraordinaire Doug and Manny are off to outer space Mendy, the girl of Manny's dreams, has been whisked away by an alien bounty hunter and it's up to the boys to do whatever is necessary to get her back Luckily, they won't be alone, though Everybody's favorite manshark Punchy McCobra, the wise-cracking ET K'arl, the caveman-turned-scientist Doc Papper, and even the mysterious Zombie Kitten will be riding along to the rescue. But will this ragtag team be enough to save the girl and themselves from the worst the universe has to offer?